Our garden will never be "finished." It took me a while to realize this. I used to think, "as soon as we're done with this project, the garden will finally be done." But nothing is ever static in a garden. Plants continue to grow and need to be managed. Sometimes "managing" involves the most drastic of measures: complete removal. That's what I did in the front yard, in the bed inside the fence. It used to be home to things like salvias, globe mallows and similar perennials (2010 2011 2013 2016). They look great in late spring. But by the end of summer they're rangy and ratty. And in the winter many of them go dormant. I finally had enough and took virtually all of them out in the spring. I only left the Meyer lemon, the 'Golden Tulip' leucadendron to the right of it, and the 'Jester' leucadendron and white sage to the left. 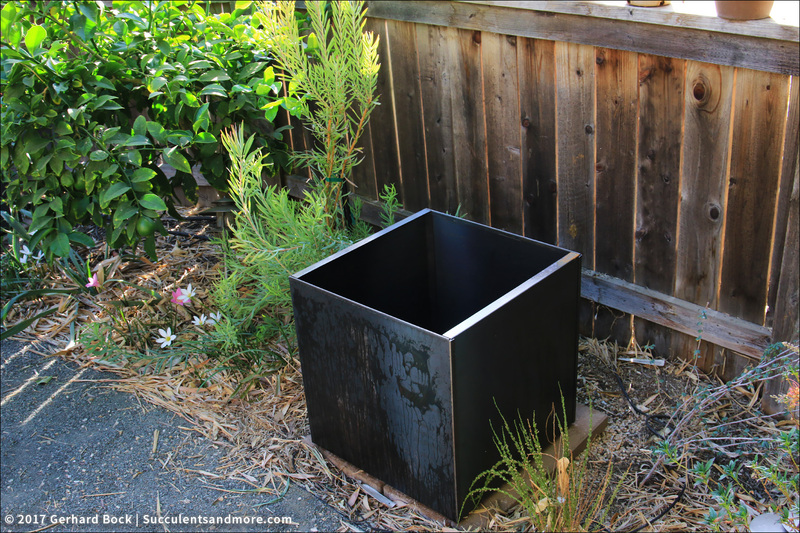 Earlier in the month I had ordered two 20x20x20 inch Corten planters. They would be the focal point of this bed. My wife and I put them together yesterday and I'm very excited. They're still plain gray steel but they will rust soon enough. There isn't much room next to the right planter, but I'm looking for something tall and narrow to go behind it. Suggestions anyone? 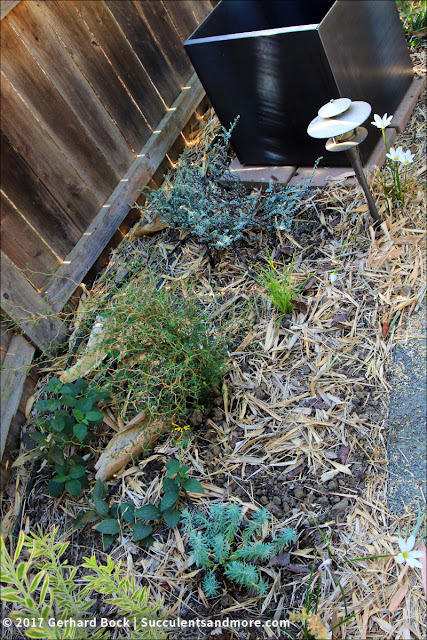 In the same bed, further to the right, I planted a Grevillea 'Wakiti Sunrise' from Markham Nature Park & Arboretum in Concord, CA. 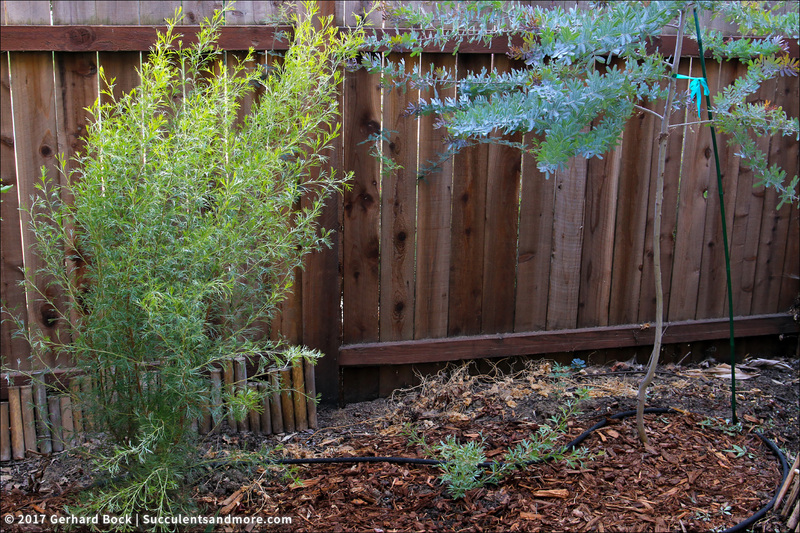 This is a low-growing grevillea that only gets to 2 ft. in height. I think it complements its neighbors very well: Grevillea 'Flora Mason' on the left and Acacia baileyana 'Purpurea' on the right. There's much more to be done, but the first steps—the baby steps—are the hardest and the most important. Now to answer the question that I'm sure must be burning in your minds: What will I put in the Corten planters in the front yard? I'm afraid the answer is a wishy-washy "I don't know." Initially I thought of medium-sized agaves like Agave parrasana and Agave 'Snow Glow'. 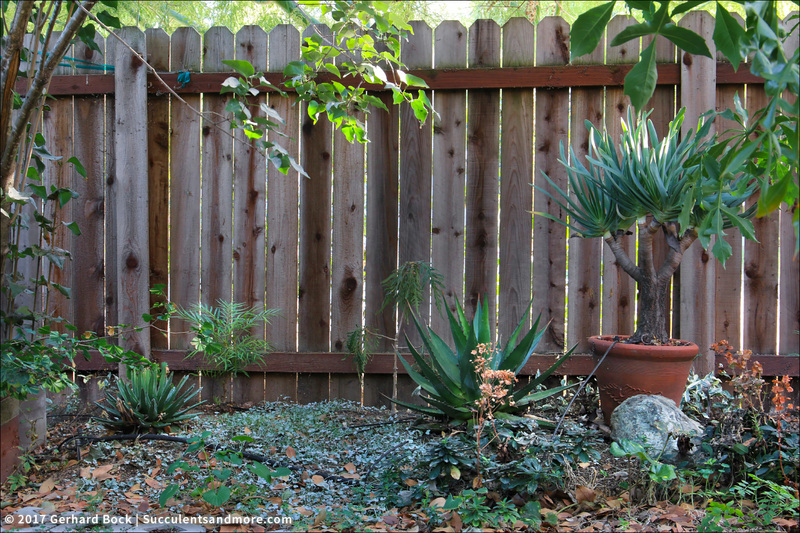 Right now, though, I'm leaning towards mangaves, hybrids between agaves and manfredas. Loree sent me pups of several new varieties in the spring (including this beauty) and they have thrived in pots. I'll post an update as soon as I have made up my mind. I don't know how you feel about grasses in this area Gehard, but Panicum 'Heavy Metal' is so fabulously tall and skinny--I planted two last fall and love them. They get water once a week, if that , have fabulous blueish foliage and the back-lighting is fantastic. Good luck finding then around here though-I ordered mine from Digging Dog. Bet I could dig up a piece for you this fall if you have an interest. Slowly spreading so may not stay "skinny" enough for this spot. Plus shading from the fence is a concern? Panicums only stay upright with loads of sun. I just saw 'Heavy Metal' at a nursery in Portland. I'd love to try it *but* the spot behind the planter won't see much sun and the grass would be in the shade until it gets tall enough. I like what you've done, and those are some great new plants. Thanks, David. Now it's just a matter of waiting until the plants get tall enough to fill in the bed--and to find some small stuff for the front of the bed. Maybe Echeveria 'Imbricata'. I second the Panicum, although I haven't grown it in at least 20 years. Your new spot is shaping up great! Cant' wait to see it as it evolves. So true that a garden is never really done. I'm looking forward to the end of the "hard work" (putting in edging, creating beds, removing sod, etc.) and we get get back to what I think is ore fun...refreshing beds, making space for new plants, etc. Gardening is a neverending editing process, isn't it? I *was* thinking of some sort of vine. Will look into passifloras! Where do you order Corten planters? I love how the new area is shaping up. I have at least two areas that need everything pulled out as well and redone. My husband used to ask when the garden would be done, but he doesn't ask any more. LOL, the garden is never done. I've finally accepted that--and actually welcome it. 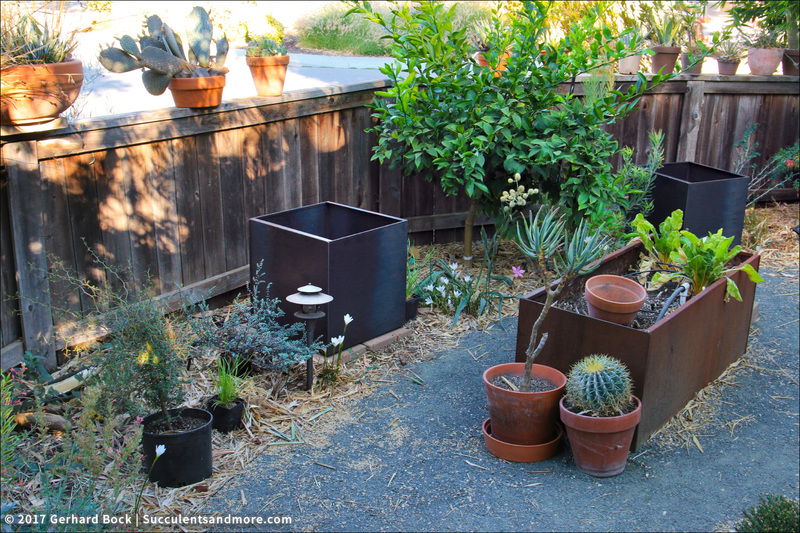 I got my Corten planters from Houzz.com. I've been enjoying the PNW get-together on IG. I'm constantly shifting around the ratty quotient too -- tolerance levels go up and down. This is going to be fantastic. 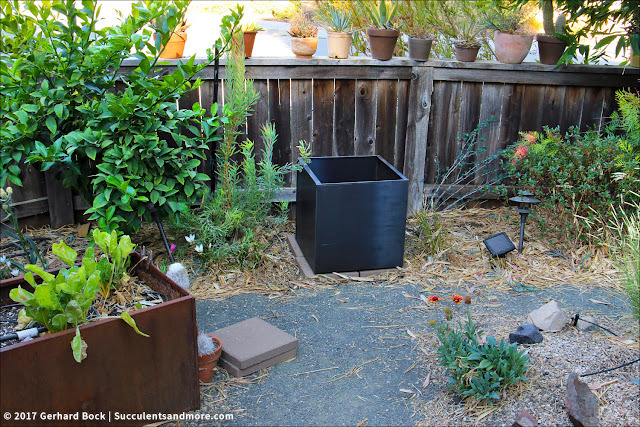 If you ran automatic irrigation to those planters you could even consider some small trees to bring some height and maybe even light shade if you need it over the succulents for summer. I've enjoyed Acacia iteaphylla in a large can this summer -- you've given yourself lots of options, which is the best thing for a garden. The planters *will* have automatic drip. The main line is right behind them. Another thought I had was moving two decent-sized yuccas (Yucca linearifolia and Yucca rostrata) from near the front door to these planters. People have complained about getting poked by the yuccas. The PNW get-together was a lot of fun, but way too short! Are you going to Austin Fling next year? It took me awhile to accept too but gardens either continually evolve or they degenerate/die. I just dug up an entire succulent bed, hauled in topsoil to create mounts, brought in almost another ton of rocks, and replanted (and I still can't say it's "done"). I look forward to seeing how your space evolves too and getting a good look at all those new plants! Your new succulent bed is killer! So much impact right from the start. 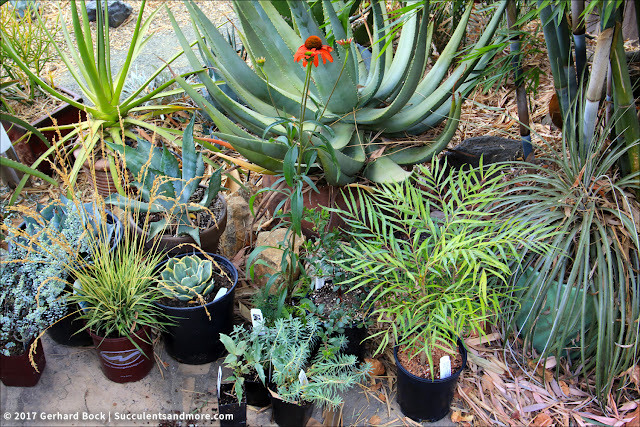 You brought some great plants home with you! Salvias and similar plants make nice, fast fillers in a young garden, but they do tend to be ratty. I made giant leaps in building my current garden, but the longer-lived structural plants are all very small and will need time to grow. So I have a lot of those quick, ratty fillers right now. 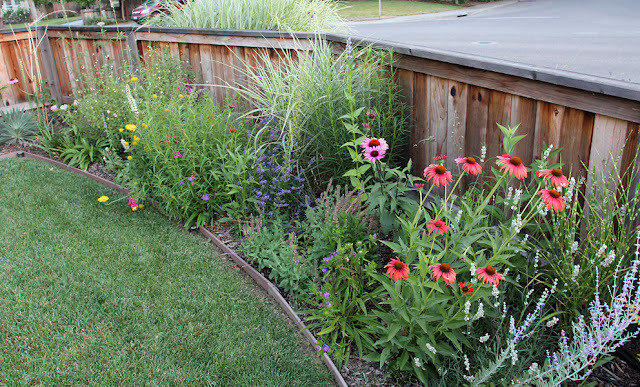 As the more permanent plants grow, they'll displace the quick fillers (or hopefully someone will remove those plants as needed) and now it's time for those baby steps to refine those plantings as they develop. Funny, even in a garden I don't intend to stay in, the work is never done. I agree with you about filler plants. They *are* necessary, but sometimes I let them overstay their welcome. Another lesson I need to take to heart. 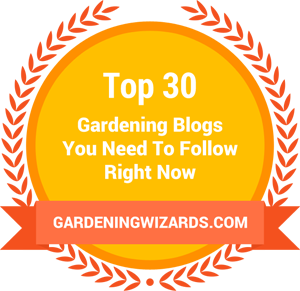 Gardeners need to garden, even if it's in somebody else's garden! I'm sure your parents appreciate all your hard work. "Kaizen", "change for better" is a great concept for the garden. Are those new planters going to be shaded? Otherwise perhaps plants with root systems that tolerate high heat would be a good choice. Re: tall and narrow, I'm very pleased so far with Callistemon 'Slim', 3' wide, 10' tall, tough, flowers for the hummers. The Corten planters will get a fair amount of sun in the summer--more on top than on the sides, though. I'm thinking of insulating the sides with sheets of Styrofoam. I saw Callistemon 'Slim' somewhere recently but can't remember where. It's remarkably skinny. Perfect for so many tough situations! I agree, our work is never done and neither are our gardens. 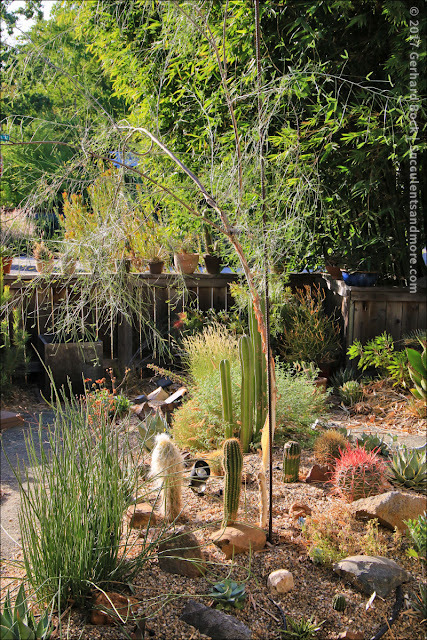 Some areas peak at one time and the plants there never regain the balance and grace they had for a couple years. 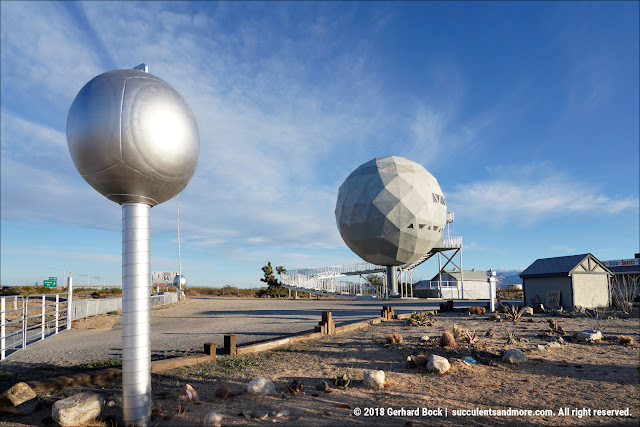 Other areas come on and surprised us when they take over as main attractions. But if we never allow for baby steps in the beginning, we never get to those peak moments. Only the hardscape is constant, and even that can vary.